2008 – It’s A Leap Year! The vernal equinox is the time when the sun is directly above the Earth’s equator, moving from the southern to the northern hemisphere. The mean time between two successive vernal equinoxes is called a tropical year–also known as a solar year–and is about 365.2422 days long. Using a calendar with 365 days every year would result in a loss of 0.2422 days, or almost six hours per year. After 100 years, this calendar would be more than 24 days ahead of the season (tropical year), which is not desirable or accurate. It is desirable to align the calendar with the seasons and to make any difference as insignificant as possible. By adding a leap year approximately every fourth year, the difference between the calendar and the seasons can be reduced significantly, and the calendar will align with the seasons much more accurately. Filed under: Astronomy | Comments Off on 2008 – It’s A Leap Year! (1) can the Martian arctic support life, (2) what is the history of water at the landing site(s), and (3) how is the Martian climate affected by polar dynamics? Phoenix in the clean room at Lockheed Martin in Denver, CO.
How will the Phoenix spacecraft communicate with engineers on the Earth? Like all of NASA’s interplanetary missions, Phoenix will rely on the agency’s Deep Space Network to track and communicate with the spacecraft. The network has groups of antennas at three locations: at Goldstone in California’s Mojave Desert; near Madrid, Spain; and near Canberra, Australia. These locations are about one-third of the way around the world from each other so that, whatever time of day it is on Earth, at least one of them will have the spacecraft in view. Each complex is equipped with one antenna 70 meters (230 feet) in diameter, at least two antennas 34 meters (112 feet) in diameter, and smaller antennas. All three complexes communicate directly with the control hub at NASA’s Jet Propulsion Laboratory, Pasadena, Calif. Phoenix will communicate directly with Earth using the X-band portion of the radio spectrum (8 to 12 gigahertz) throughout the cruise phase of the mission and for its initial communication after separating from the third stage of the launch vehicle. The cruise stage carries two copies of its communications equipment, providing redundancy in case of a problem with one of them. The mission will use ultra high frequency (UHF) links (300 megahertz to 1,000 megahertz), relayed through Mars orbiters during the entry, descent and landing phase and while operating on the surface of Mars. A UHF antenna on the back shell will transmit for about six minutes between the time the cruise stage is jettisoned and the time the back shell is jettisoned. From then on, a UHF antenna on the lander deck will handle outgoing and incoming communications. The UHF system on Phoenix is compatible with relay capabilities of NASA’s Mars Odyssey and Mars Reconnaissance Orbiter, and with the European Space Agency’s Mars Express. Phoenix communication relays via orbiters will take advantage of the development of an international standard, called the Proximity-1 protocol, for the data transfer. This protocol was developed by the Consultative Committee for Space Data Systems in an international partnership for standardizing techniques used for handling space data. The Phoenix spacecraft’s UHF signal might also be receivable directly via the Green Bank Telescope in West Virginia. Data transmission is most difficult during the critical sequence of entry, descent and landing activities, but communication from the spacecraft is required during this period in order to diagnose any potential problems that may occur. An antenna on the back shell will transmit during entry and descent. 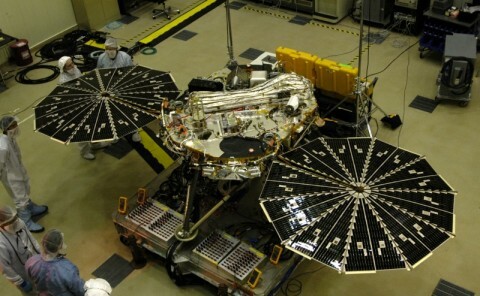 Another, on the lander deck, will transmit and receive during the final moments of descent and throughout the surface operations phase of the mission. Interesting New Scientist weekly video wrap-ups! Lots of time, money and smart minds at work… Each week gets a wrap-up! Nice telephoto of the 022008 Eclipse at APOD! Makes the moon look a lot closer than 250,000 miles away. Runaway Satellite – Navy Direct Hit! Well, they hit the runaway satellite on the first attempt. Not a surprise, but I think the direct hit will erase some doubts about current missile tech abilities. It should be very soon that we’ll see an increase in the missile defense budget… he said smugly. This youtube video shows the actual hit. Pretty awesome explosion! The USS Lake Erie, armed with an SM-3 missile designed to knock down incoming missiles — not orbiting satellites — launched the attack at 10:26 p.m. EST, according to the Pentagon. It hit the satellite about three minutes later as the spacecraft traveled in polar orbit at more than 17,000 mph. The Lake Erie and two other Navy warships, as well as the SM-3 missile and other components, were modified in a hurry-up project headed by the Navy in January. The missile alone cost nearly $10 million, and officials estimated that the total cost of the project was at least $30 million. Doh! Filed under: Astronomy | Comments Off on Runaway Satellite – Navy Direct Hit! Total Lunar Eclipse – tonight! The Moon will move into The Earth’s shadow for a short time tonight. We’ll have a 50 minute window to view the Total Eclipse. The image below represents best views in The Central Standard Time Zone. 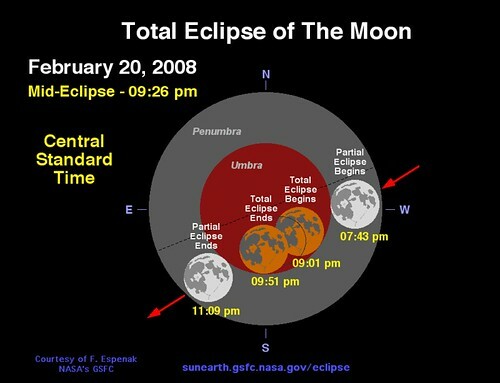 The next Total Eclipse will occur in December 2010. Unlike solar eclipses, lunar eclipses are completely safe to watch. A lunar eclipse can be observed with nothing more than the naked eye. However, a pair of binoculars will magnify the view and make the red coloration brighter and easier to see. A standard pair of 7×35 or 7×50 binoculars is sufficient. This video shows how The Columbus Lab was hoisted from The Shuttle Atlantis and docked to The Harmony module. Makes that 11 tons look not so heavy. Very cool! This is a great explanation of what this particular ISS mission was all about. 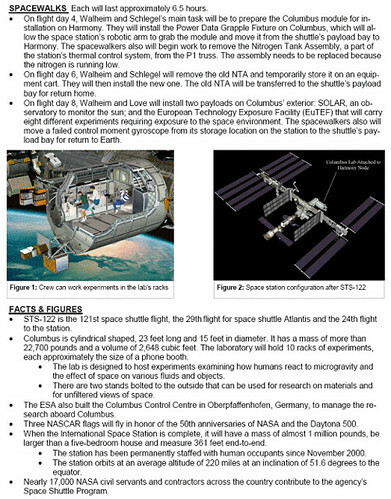 A full working lab “addition”, The Columbus module, provided by the European Space Agency. Man, it’s difficult for most people to add a front porch awning to their home. Check out the stats below. This was quite a credit of accomplishment to NASA and ESA. Hope for a successful Atlantis landing tomorrow! Here is an amazingly clean photo of the Columbus module after installation. Filed under: Astronomy | Comments Off on Atlantis STS-122 Columbus module!! The Navy shouldn’t have much of a problem tracking and intercepting the U.S. runaway satellite US 193. The satellite, a bus-size craft weighing about 5000 pounds and carrying a load of hydrazine fuel, was launched in December of 2006 and very soon after launch lost communication, leaving it uncontrollable. 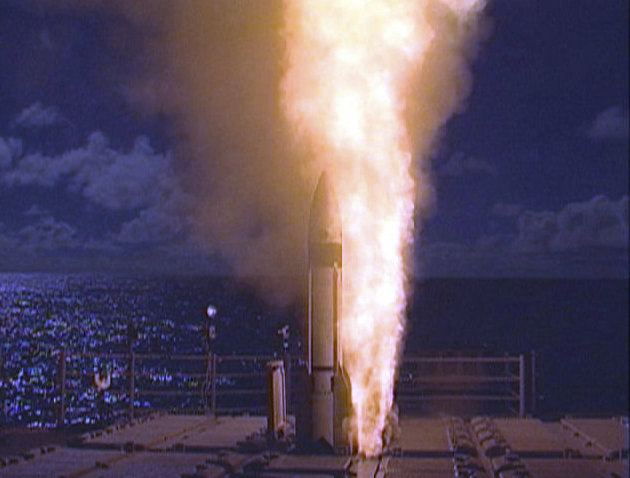 A Navy cruiser will deploy Standard Missile 3 to get the job done and most of the debris (assuming the target is hit) should burn up when it falls through earth’s atmosphere, but not all of it. China had to shoot down a weather satellite recently and had success, but debris was an issue. 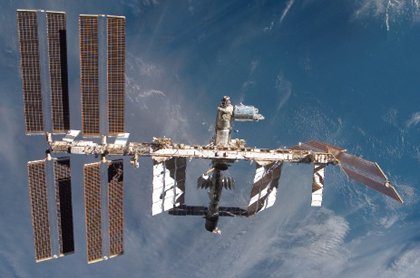 In the past 50 years of monitoring space, about 17,000 man-made objects have re-entered the Earth’s atmosphere. They’ll launch SM-3 as early as next week and if all goes as planned, will engage US 193 at about 150 miles above the earth. The ISS is at about 200 miles out. At the 1st of this month, US 193 was about 170 miles out. Recent Aegis BMD tests have been successful in Nov. and Dec. 2007. Read about the SM-3 test program here Looks like this will add fuel to the missile research and development budget. This is an amazing image of The Rosette Nebula, fit for a Valentine’s Day. It’s a cosmic cloud of hydrogen gases about 50 light years in diameter. 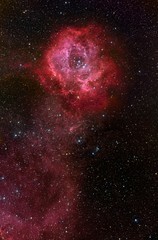 The winds and radiation from it’s center happened to have sculpted it into what looks like a long-stemmed rose. View a (5mb) large image size here: NGC2244.